KSC Pegboard tool holders and organizers help you get organized and stay organized so you can get the job done faster. No more searching for your tools. Simply use these tool holders and organizers on any standard peg board and your tools will be safely stored in clear sight. 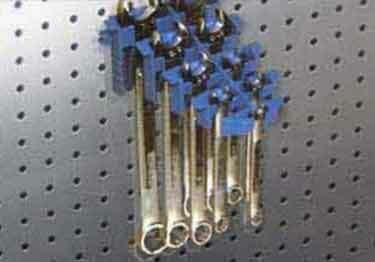 Perfect for holding wrenches, screw drivers, saw blades, drills, tape, wire, cordless drills, etc. Power Drill Storage and Recharging Station: Holds most drills and power pack set up to 10 lb. Storage for 11 drill bits 1/16' to 3/8", pocket for holding standard size drill bit case. Large 5-1/2' x 6-3/4' power pack platform. Mounts to pegboard or solid wall. KSC attractive Chrome Peg Hooks look great and are available in many styles and sizes.